Set in the wilderness of the legendary mystical mountains of the moon as earlier described by the famous Greek Geographer Ptolemy in the year 150 ADF, the new Mahoma Trail is a wonder of its own that keeps a cross section of Uganda safari undertakers mesmerized. 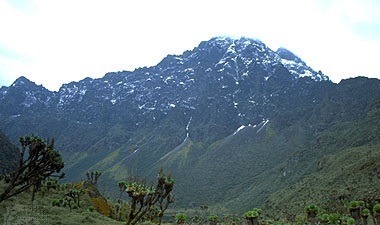 Supplementing the traditional Central and Kilembe circuits that lead to the top of the snowcapped Rwenzoris with the Margarita peak towering to 5,109m above sea level, Mahoma trail is a 2 nights and 3 days encounter that takes any travellers on Uganda safaris and tours interested in exploring the Rwenzori in the limited time possible up to the famous Lake Mahoma though the provision for extension to John Matte hut can be arranged. Commencing from Ibanda or Nyakalengija, the mahoma trail takes you through the famous Kyambogho ridge with its pristine forest offering impressive views of Mubuku Valley and counts of primates that inhabit the forested ridge including black and white colobus monkey, L’hoests Monkey, blue monkey, among others until resting at Omu’ka Kizza Rest Camp at 2,977 meters gaining impressive views of Kasese town (2,160m below) and Rwenzori foot hills. At this camp, you spend the first night of Mahoma trail encounter while on safari in Uganda. This is followed by a hike in the following morning to the Mahoma Lake. The narrow ridge covered by moss leading up to 3,515m takes you through impressive lush forest of remarkable giant heather with bright green moss layers. The mountain elephant foot prints may not be missed across the heather and bamboo forest and if lucky one can catch up with them as they drink at the hot spring. The ridge stretch continues to Rukenga Valley marked with impressive flowers (mimulopsis eliotti) and the beautiful giant lobelia fancied by travellers on adventure safaris in Uganda. The resting for overnight is at Mahoma Lake Camp and with a clear sky; the views of Mt. Stanley, Mt. Baker and Portal peaks can be explored. This encounter is followed by a descent back to the star t point at Ibanda or Nyakalengija full of lasting memories that will make the Uganda safari tour a remarkable event in your life.